There was a good discussion in which everybody participated. This discussion also formed the basis for the debates at the National AGM held in Glasgow on Saturday, June 30th. Present- Jonathon S (Convenor); - Angus C (Angus & Mearns); Craig L (East Kilbride); Allan A, David S, Nick G, Pat S, Pete C (Edinburgh); Grant B (Fife); - Jane L (Glasgow South) Stirling - Billy McC (Stirling); Steve F (London). 1. Introduction - Jonathon gave a political outline of the situation RIC faces. This was followed by contributions from all those present. "The case and the mandate for a new referendum on independence is well established, and the risks involved in delay are greater than the risks of pushing ahead vigorously. We demand the Scottish Parliament act. Either an MSP from the Green Party or from the SNP could put to the Scottish Parliament a proposal for a new referendum on independence to be held within a specified time (such as six months) of their proposal. The Scottish Parliament should back such a proposal. Our demand is addressed to the Scottish Parliament, NOT to Westminster. We don't recognise Theresa May or any other Member of Westminster has a right to say 'Now is not the time'." h) uphold the principle of a civic Scottish nation against all attempts to redefine Scottishness on the basis of racial or ethnic criteria, including attempts to restrict any franchise on this basis." a. 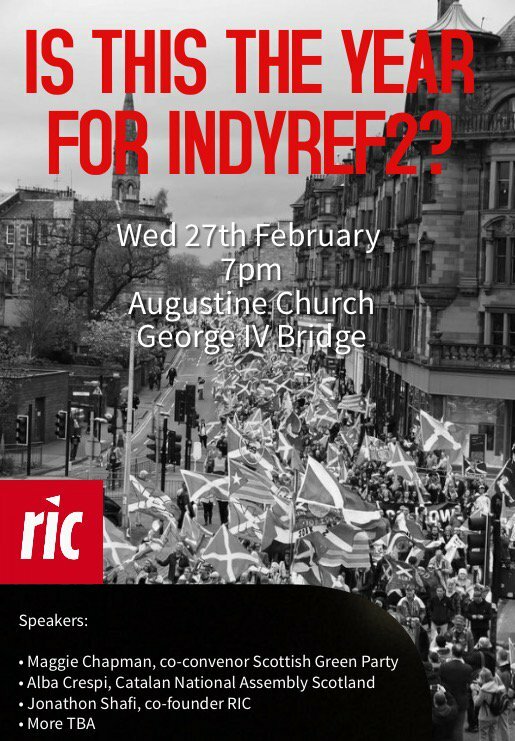 This meeting recognises that a majority of the Scottish people voted to remain in the European Union. b. We condemn the Tories imposing a hard anti-working class ‘all British Exit’ on Scotland. c. We call on the Scottish government to hold a ratification referendum on the Tory deal. d. We note that if a majority of the Scottish people vote against the Tory deal this would be a justification to trigger a second Independence referendum.